A year after Trump said he’d ban trans people from the military, how successful has he been? One year ago today, Trump tweeted that he would ban transgender troops from serving in the U.S. military. Since POTUS’ neurotic tweet, the trans military ban has failed at every level – state and federal. A video timeline is available for viewing to give additional background on the case’s milestones. The Karnoski v. Trump lawsuit originally filed by Lambda Legal and OutServe-SLDN was aimed at opposing this president’s discriminatory policy in the courts, on the streets and in the media. As of today, seven federal courts – including, most recently, the U.S. Court of Appeals for the Ninth Circuit – have barred the Trump-Pence Administration from implementing the ban. Since the president’s initial tweets, a diverse range of voices have opposed banning transgender people from serving in the military. 33 former national security experts and military leaders, the American Medical Association and the NAACP all filed briefs in support the cases filed to halt the Trump-Pence ban. “After the tweetban was issued, Lambda Legal and Outserve-SLDN flew into action. We promised we would take action if the policy was enacted and we did,” said Lambda Legal Staff Attorney Sasha Buchert. “From day one of this administration, Donald Trump and Mike Pence have sought to license discrimination against the LGBTQ community, particularly transgender people,” said HRC National Press Secretary Sarah McBride. Trump has a pattern when it comes to losing. He just keeps trying to cram it down our throats in new incarnations, hoping we don’t notice his boundless stupidity for the rule of law and order. Unfortunately for him and his cronies, Americans are not buying it. Neither is the military. “Over the last year, transgender service members continue to prove detractors wrong, serve with honor, and help the mission succeed,” President of SPARTA, Blake Dremann, told LGBTQ Nation. A few days ago, the federal court rejected Trump’s latest attempt to push through a trans military ban. “The district court’s December 11, 2017 preliminary injunction preserves the status quo, allowing transgender service members to serve in the military in their preferred gender and receive transition-related care,” the decision said. However, with Kennedy’s looming retirement from the bench and the Supreme Court inching ever-closer to the right, the protection of LGBTQ rights in any capacity is no longer foolproof. 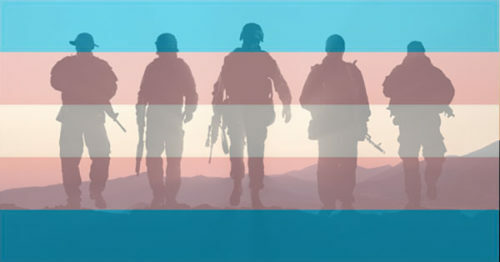 “Every court ruling has been consistent and unequivocal: the ban on transgender military service is discrimination, no matter how it’s phrased and no matter the myriad ways the administration has tried to cloak its intent,” OutServe-SLDN Legal Director Peter Perkowski said. “The administration has failed to come up with any adequate rationale for the president’s ill-conceived tweets of last July that justifies their blatant discriminatory nature, and we are confident it never will,” he added. Today, the hashtags #TransMilitaryBan and #TransBanTweetUp are trending on Twitter and we’ve selected a few of our favorite posts below.